Contemporary life is highly demanding and stressful; if you’re not properly grounded through Yoga’s balancing postures, you face a constant risk of being pushed out of balance. Grounding means being centered and firm without being inflexible, knowing who you are and what you want, and feeling that you’re empowered to achieve your life goals. A good way to begin your grounding work is by improving your physical sense of balance, which helps you synchronize the movement of your arms and legs, giving you poise. 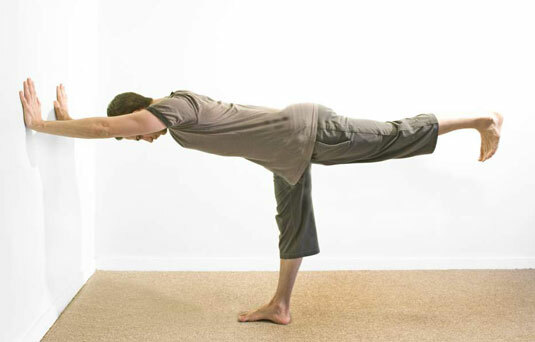 The following postures appear in order of easier to more advanced exercises. Breathe freely through the nose and pause briefly after inhalation and exhalation. Stand in the mountain posture, facing a blank wall about three feet away. As you exhale, bend forward from the hips and extend your arms forward until your fingertips are touching the wall. 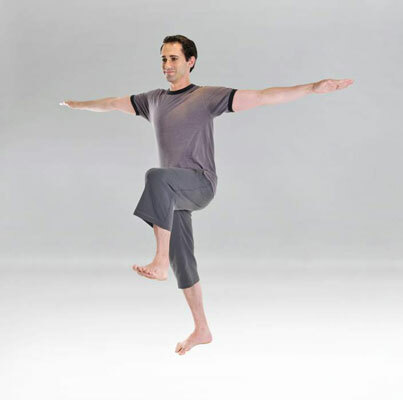 As you inhale, raise your left leg back and up until it’s parallel to the floor. Stay in Step 3 for 6 to 8 breaths; repeat with the right leg. Balancing cat strengthens the muscles along the spine (the paraspinals), as well as the arms, and the shoulders, and it opens the hips. The posture enhances focus and concentration and also builds confidence. Beginning on your hands and knees, position your hands directly under your shoulders with your palms down, your fingers spread on the floor, and your knees directly under your hips. As you exhale, slide your left hand forward and your right leg back, keeping your hand and your toes on the floor. 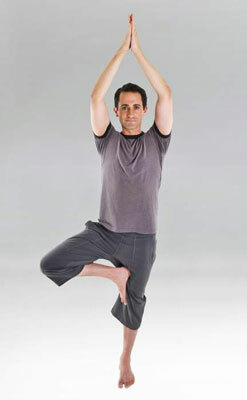 As you inhale, raise your left arm and right leg to a comfortable height. Stay in Step 3 for 6 to 8 breaths and then repeat Steps 1 through 3 with opposite pairs (right arm and left leg). Stand in the mountain posture. As you exhale, bend your right knee and place the sole of your right foot, toes pointing down, on the inside of your left leg between your knee and your groin. As you inhale, bring your arms over your head and join your palms together. Soften your arms and focus on a spot 6 to 8 feet in front of you on the floor. Stay in Step 4 for 6 to 8 breaths and then repeat with the opposite leg. Note: In the classic (traditionally taught) version of this posture, the arms are straight and the chin rests on the chest. As you inhale, raise your arms out to the sides parallel to the line of your shoulders (and the floor) so that they form a T with your torso. To steady yourself, focus on a spot on the floor 10 to 12 feet in front of you. As you exhale, bend your left knee, raising it toward your chest. Stay in Step 4 for 6 to 8 breaths; repeat with the right knee. As you inhale, raise your left arm forward and overhead. As you exhale, bend your right knee and bring your right heel toward your right buttock, keeping your left leg straight. Grasp your right ankle with the right hand. Stay in Step 4 for 6 to 8 breaths; repeat Steps 1 through 5 with your left foot. While on your hands and knees, position your hands directly under your shoulders with your palms down, fingers spread on the floor, and your knees directly under your hips. Place your right forearm on the floor with your right hand just behind your left wrist. As you inhale, lift your right knee off the floor, raise your chest until it’s parallel to the floor, and look up. Find a comfortable height for your chest and raised leg. Steady yourself by pressing your right forearm and thumb on the floor. Stay in Step 3 for 6 to 8 breaths and then repeat Steps 1 through 4 on the opposite side (left forearm and left foot).